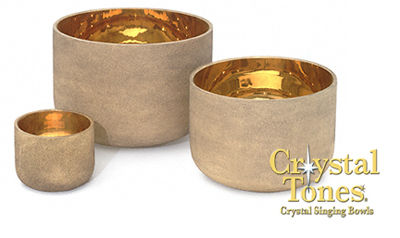 A softly gleaming, elegant classic bowl infused with 24-K Gold, the energy of royalty, success and soul expansion. Its mirrored interior reflects a magical "master of illusion" golden hologram, a visual doorway into crystalline consciousness that creates a golden sound temple in any setting. The Solid Gold Classic Bowl holds all master conductor frequencies for sonic reconnective patterning, molecularly energizing the body and enriching life experiences �a conscious sonic walk in Light. Available in sizes 8" - 18".